The final day of the Bhagavad Gita course with Paramahamsa Sri Swami Vishwananda was an extraordinary day that concluded the course with inspiration and gratitude. 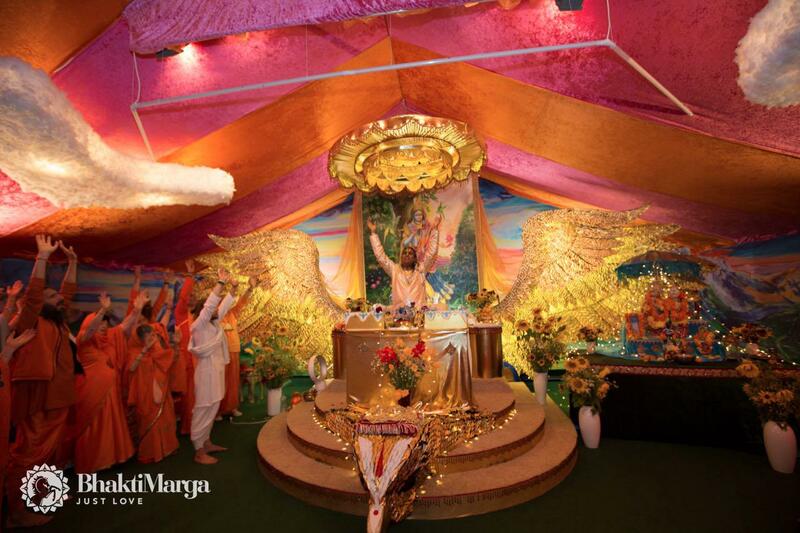 On Day 8, Swamiji gave commentary solely on chapter 18, the last chapter of the Gita. With only having one chapter left, Swamiji spent the entire day explaining the ending of the glorious conversation between Lord Krishna and Arjuna. "Without any attachment either to the action or the fruit of the action, this is regarded as sattvic. 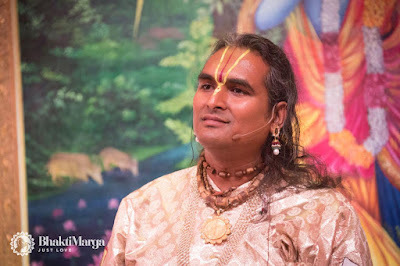 If your heart is non-attached to the reward, to whatever you gain from it, how people are seeing, what they are seeing, this is true renunciation. You don’t expect any recognition. You do it in the quietness. So, that’s what Jesus said also in the Bible, no? He said, if you want to pray don’t make it a show. Go in the deepest corner, the quiet and the renounced corner and pray to your Father. Know that He is looking at you. In chapter 18, Moksha Sannyasa Yoga (path of liberation through renunciation), Arjuna makes his final questions to Krishna. They all point to one direction - clarifying the route to Moksha, total realisation. After discussing many topics, Krishna gives particular emphasis to three paths leading to Moksha. Karma Yoga, Jyaana Yoga, and most importantly and most emphasised by Bhagavan, Bhakti Yoga. 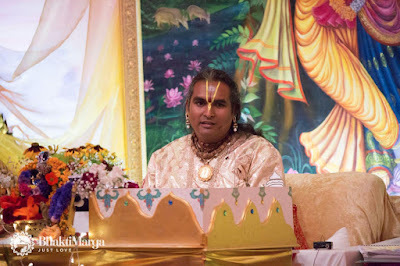 Krishna then concludes his own teachings and summaries them for Arjuna, giving specific instructions in relation to what He wishes his disciple to do with these teachings he has received. By the end of the chapter, Arjuna has completely transformed, and with his ignorance and disillusionment dispelled, Arjuna is now ready to fight in the Mahabharat War. 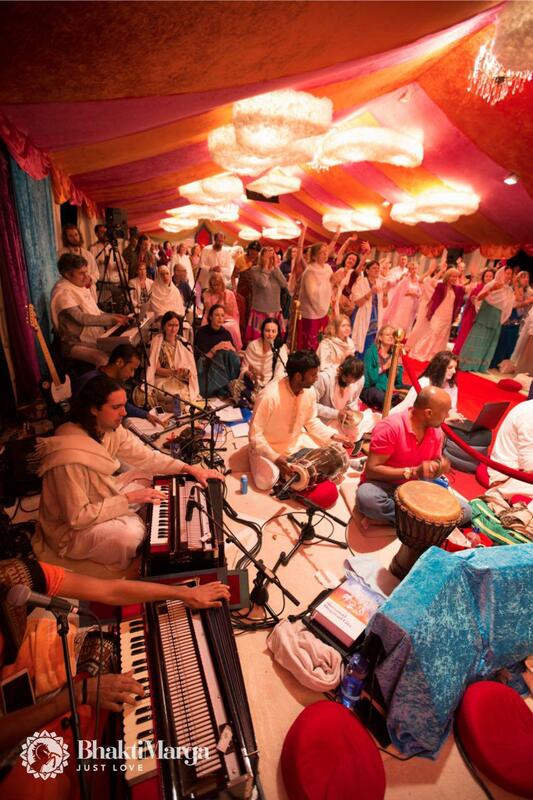 "When that bliss awakes itself, all is transformed and all is purified. That bliss becomes eternal. Bhagavan is talking about the supreme bliss itself, Satchitananda. This eternal joy, it’s not a joy which comes today and tomorrow it's not here. It doesn’t depend on anybody. The ones who dwell into that sattvic state, they are always absorbed in that blissful state. 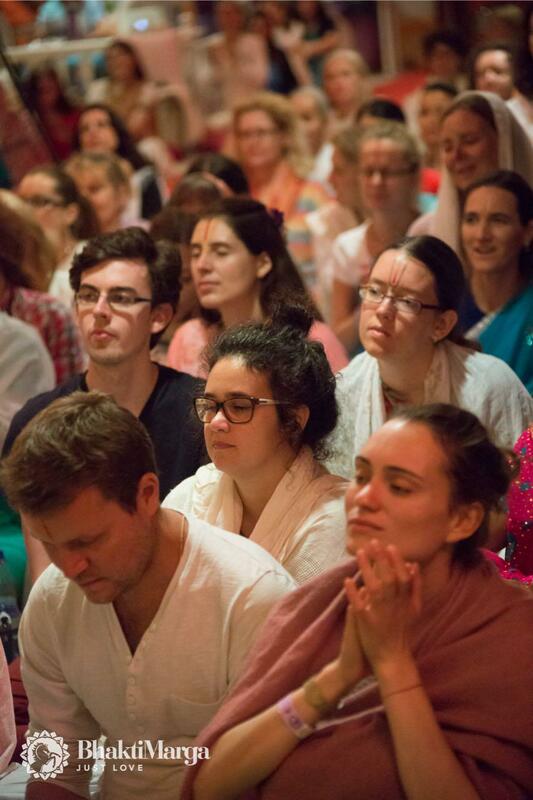 It is like when you walk towards Realisation, when you are doing your sadhana, you have to have this joy of doing one’s sadhana. Those God-realised souls, those devotees which are longing for the Love of God, they should continuously focus upon that love. More they concentrate upon this love, they will go through the nine steps of devotion where all the five kinds of bhav will awake. One’s qualities, happiness, all this will awake itself. When one attains that true happiness, this happiness is also projected in all directions. This happiness purifies all. This happiness enlightens all. They become themselves an example of the Divine Love. They become themselves without any worry, without any effort. Things happen automatically through them. 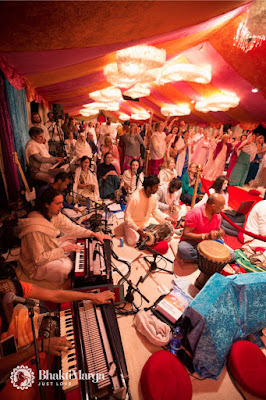 You see, often people who encounter you, because you are centred into this divine quality, you know, because you chant the Name of God, sometimes people will like to be with you. It’s not that they want something from you, but just by being in your presence they feel happy. Just by being near to you they feel the sense of calmness. "This is the most important verse in the whole Gita. This is the most important phrase which our Sampradaya holds dear to. This is the main teaching of the Sri Sampradaya. 'Abandon all dharmas and take refuge in Me alone.' 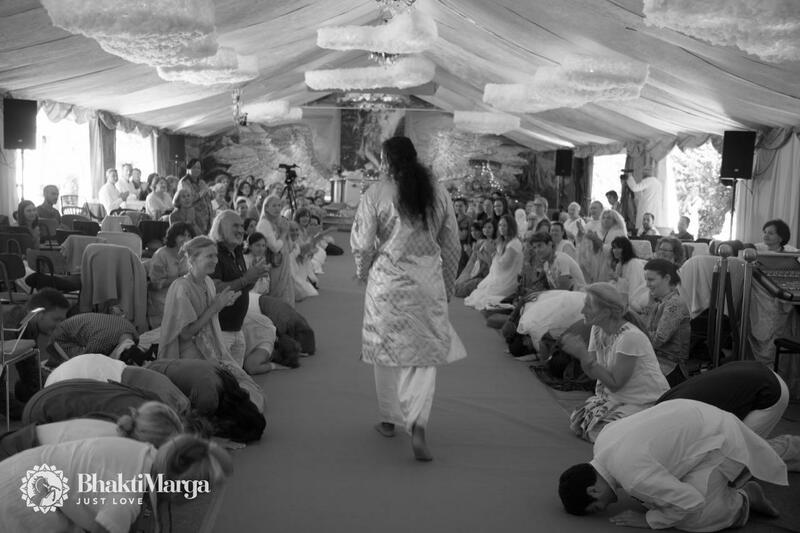 There is only one dharma and that dharma is to surrender to the Feet of the Lord. Here Bhagavan Krishna Himself reminds Arjuna, 'You don’t need to concentrate on any rules. Once you are surrendered, those who are truly surrendered, those minds which are fully absorbed in the surrender to the Feet of the Master, for them all the rules are gone. All the regulations are gone, because that abandonment itself, the letting go of every concept and taking refuge at the Feet of the Lord will awaken the Supreme Realisation. That’s the dharma. That’s the supreme dharma of all creation itself. Every living entity in this whole universe has only one aim: to attain the Lord, to eternally dwell with Him, to attain to that awareness, to awaken that realisation that Lord Krishna is the greatest well-wisher, the guardian and the supporter of all. 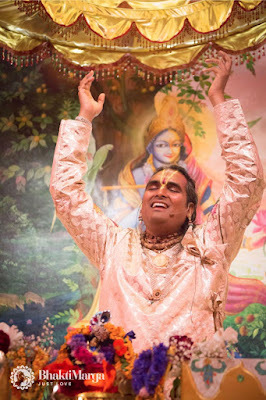 Thank you for following the blog for these last 8 days as we covered the Bhagavad Gita Course with Paramahamsa Sri Swami Vishwananda. Jai Gurudev!